MELINDA: Well, hello there, my friend! MELINDA: Well. That’s interesting indeed. I’ll admit I’m not quite sure how to respond to that. Perhaps, instead, I’ll change the subject. Read any good manga this week? MICHELLE: I did. Kind of unexpectedly good, in both cases! 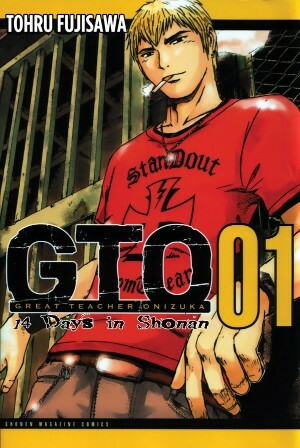 One of the things I read was the first volume of GTO: 14 Days in Shonan by Toru Fujisawa (published by Vertical, Inc.). I knew absolute nothing about the GTO franchise going into it, and therefore had no idea what to expect. The initial setup, which explains how ex-delinquent-now-teacher Eikichi Onizuka has to lay low for a while and decides to do so in his hometown of Shonan, caused me a bit of concern, since it involves the hapless protagonist getting into all sorts of trouble and a comedic sensibility that put me in mind of Detroit Metal City, which, as you know, was not my cup of tea. Once Eikichi gets to Shonan, however, things begin looking up. He meets up with an attractive young woman named Ayame Shiratori, who was classmates with one of his coworkers. She’s heard that Onizuka has done wonders with his students and wonders if he’d help out at White Swan Children’s Home for a bit. Since he has no place else to go—and since he would like to roger Ayame—he agrees. Although the hostility of one of the students, Katsuragi, is immediate and rather over-the-top, I warmed to the series once Onizuka showed a real flair for getting through to miserable teens, each the victim of selfish parents. He does it so naturally that it doesn’t feel like Fujisawa is imparting some Important Moral Lesson. Essentially, he treats them like people and instinctively understands how to draw them out. And he’s willing to put his money where his mouth is and defend them with everything he’s got when they are threatened. For kids who’ve come to distrust the sincerity of adults, an idiot—but a genuinely honest idiot—like him may be exactly what they need. I’m not sure if I’m ready to track down the other GTO volumes that have come out in English, but I am at least looking forward to volume two! MELINDA: Well, as Detroit Metal City decidedly was my cup of tea, I’m intrigued all-around! Like you, I knew almost nothing about GTO before Vertical announced this license, and I’ll admit I was initially hesitant, thinking it might be hard for a newcomer to jump in at this point. But it sounds like this is really not an obstacle. MICHELLE: Not at all. Aside from a couple of brief appearances in the beginning, 14 Days in Shonan features an entirely new cast of characters. It’s interesting, too, that it’s kind of slipped into a two-week period of the main story during which most people assumed Onizuka was recuperating in the hospital. So, what’ve you been reading this week? MELINDA: Well, I didn’t fare quite as well as you, though ultimately it was a good week. 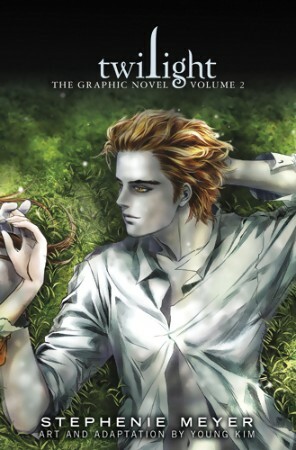 I began with the second volume of Young Kim’s graphic novel adaptation of Stephenie Meyer’s Twilight. And while my reaction to the first volume was something along the lines of, “This was more readable than expected,” I’m afraid the second volume didn’t go down quite so easily. To be clear from the get-go, none of my issues are Young Kim’s fault, and I expect I’m ultimately grateful to be reading this series in a less prose-heavy format than the original. And really, my biggest qualms about this volume aren’t even about the weirdly overt racism or the less-than-subtle lessons in sexual abstinence. What really made this volume so difficult for me to get through was my increasing anger over the fact that Stephenie Meyer did not see fit to grant her heroine even a single personal interest outside of her creepy, undead boyfriend. Bella has no thoughts or desires that don’t revolve around Edward. She has no apparent interests in school. She doesn’t even have a hobby. Her entire existence—her very identity revolves around her feelings for a boy. And though there may have been times as a teenager when I felt utterly consumed by my feelings for whatever boy I was crushing on, those were just isolated (if intense) moments, scattered amongst the hours upon hours I spent reading, writing, playing music, arguing about politics, and thinking about the multitude of things that interested and/or enchanted me in the great wide world. Honestly, even if this didn’t make me angry as an adult woman and a feminist, who longs to see a world filled with great, empowering fiction for girls, it makes me utterly unable to identify with Twilight‘s protagonist, even from the point of view of my distant teenaged self. Though I never like hearing female readers say they “hate” a female protagonist (because, seriously, it’s not the character’s fault she was so gravely shortchanged by her creator, is it? ), I have to admit that Bella is the greatest obstacle standing between me and enjoyment of Twilight, even as a guilty pleasure. And that’s really a shame. MICHELLE: I had a similar reaction when I read the book, in which Bella demonstrates some alarming passivity when she learns about the various creepy things Edward has been doing, including breaking into her house to watch her sleep. When I learned that a friend’s daughter was reading the series, I felt I needed to warn her parents so they’d be sure to give her the “if any boy ever does this to you, please know that it is not romantic” speech. To address an issue specific to the graphic novel release… some folks were critical of the typeface in the first volume, I believe, as well as the placement of speech bubbles. Did you notice any discernable change in those areas? MELINDA: The style of the second volume is the same as the first, in that it uses very non-comics-y fonts, and the way the speech bubbles look is also not what I’m used to in the comics I read. However, I never found this to be as problematic as a lot of critics did, and I rather like Kim’s art style, so I’m good with it. If anything, the artwork is one of the things I was able to enjoy in the book. So, since we’re on the topic of Yen Press “manga” adaptations, shall we move on to a title we both read this week? MELINDA: Well, when I read Kate’s review of REM’s new adaptation of Gail Carriger’s Soulless, I thought suddenly that it would be a great choice to read alongside Twilight. Both are OEL adaptations of popular novels, and both revolve around a heroine who lives in a world alongside vampires and werewolves. 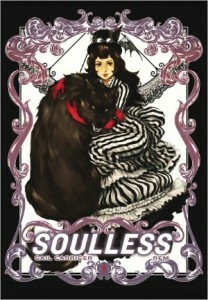 Unlike Twilight, I had very little knowledge of the details of Soulless, and though I expected I might like it more than Twilight, I was not really prepared for how much more. Alexia Tarabotti is a 26-year-old “spinster” in Victorian London, a life complicated even more by the fact that she’s also a “preternatural,” a person without a soul whose purpose is to bridge the gap between the supernatural and natural worlds. Alexia’s London is filled with vampires and werewolves, most of whom are highly regarded (and highly organized) members of society. As the story opens, Alexia accidentally kills a vampire who attacks her at a party—an event that throws supernatural society into a bit of a tizzy. Fortunately, the tizzy also rather hurries along Alexia’s long-time flirtation with Lord Conall Maccon, a well-regarded werewolf who may actually be a match for her. MICHELLE: I too knew nothing about Soulless going in and was pleasantly surprised by REM’s adaptation. Although I think I would probably enjoy the novel even more—while the relationship between Alexia and Lord Maccon is a lot of fun, the mystery plot involving missing and unaffiliated werewolves and vampires gets short shrift—the graphic novel is still tremendously enjoyable, with plenty of witty dialogue (seriously, all you need do to amuse me is mention hedgehogs), lovely supporting characters (Lord Akeldama and Ayame Sohma… separated at birth? ), and a pair of strong leads whom I like and sincerely root for as a couple. I also enjoyed how enthusiastic Alexia was to make out with him once she had the chance. MELINDA: Yes, it really is a treat to kind of adore both members of the story’s primary couple, isn’t it? I really do adore them both. And oh, Lord Akeldama… first of all, you’re on the nose with the Ayame Sohma (though Akeldama has the benefit of not being quite as self-absorbed), and secondly, I think one of my favorite moments in the entire volume was when Alexia, whose soulless nature allows her to render vampires and werewolves to their form closest to human with only her touch, grants his request to accompany him outside so that he can view the sunset. I’ll also agree that reading this made me quite anxious to try the novel, and I’ll confess I’ve already bought the e-book to read on my iPad. MICHELLE: And I’m going to buy the audiobook next time I get a new Audible credit! There are a couple of key things that make Alexia a better protagonist than Bella. For one, to directly contrast what you said before, she actually has a life outside her love interest. We don’t see much of her hobbies, true, but she visits with a couple of friends and attends social events with her family. For another, she desperately wants to be useful, and suggests several times that she be allowed to help Conall with his work for the Bureau of Unnatural Registry. One gets the impression she’d be a rather kickass demon hunter if she weren’t living in Victorian England. MELINDA: Yes, exactly, there’s a constant sense that Alexia is desperately oppressed by the constraints forced upon her, both by her place in society and her gender, and that she longs for opportunities to use her brains to really do something in the world. One of the things that makes her fiery relationship with Conall so appealing, is that they’re both characters who possess exceptionally strong will. If there’s one issue I have with the graphic novel adaptation, aside from the lack of page time available for its non-romantic plotline, it’s that Alexia is repeatedly referred to as plain, yet is drawn by REM as a voluptuous beauty. Now, I’m not exactly complaining (she’s a voluptuous beauty that even female readers can appreciate), but it might have been a nice touch if she looked just a tad less like a comic book heroine, and more like an average woman. She’s an awesome enough character to be irresistibly attractive with or without being so conventionally gorgeous on the outside, and actually “plain” women are tragically underrepresented in comics. MICHELLE: Yes, REM’s rendering of Alexia takes heaving bosoms to a whole new level. I was wondering how someone could remain a spinster so long with attributes like that! It’s almost like drawing Elizabeth Bennet with giant knockers, in that it makes the hero just a little less special for seeing in her what others don’t. MELINDA: I think I could totally buy the heaving bosoms (let’s face it, in a corset, any woman not shaped like a stick is subject to heaving bosoms) if she’d been just a little chunkier and less dazzling otherwise. But overall, it’s a small complaint. This is the first of Yen Press’ novel adaptations that has grabbed me so immediately, and I’m not only looking forward to reading the novel, but to reading the second volume of the adaptation. MICHELLE: Same here. And though it may be insanely early to call it, I have a feeling this will turn out to be the best novel-to-manga adaptation of 2012! MELINDA: I suspect you may be right! I can completely see how that might be the way she’s portrayed in the novel, from reading the adaptation, and it’s probably less jarring in prose. Reading the comic, there’s just this huge disconnect when her family refers to her as plain and we’re staring at this woman who is drawn to look at least as beautiful as (and usually more than) anyone else on the page. I’ve read all of GTO, it’s awesome, it’s pretty much Onizuka helping out his students (and trying to date their moms sometimes and ruining the one dude’s precious car at least a dozen times, each in an hilarious manner), but Fujisawa is just so amazing with his characters that when I got to volume 25 I went “No, no, I want more! Please!” And yeah, it had some problems with being a Tokyopop translation where they couldn’t decide if the characters were 14 or 17 or 18 (for legal reasons) and it switched between volumes, sometimes even chapters, leading to a bit of confusion unless you looked online to see that the student cast is supposed to be about 14. And wow could the manga get really perverted at times (if you think Onizuka acts perverted, at least he doesn’t watch people go to the bathroom from underneath the seats in the trough, I am not kidding when I say that happens in the manga, it got cut from the anime), and the main female teacher is nothing but a love interest, but you have Urumi Kanzaki to make up in the awesome females department. And I feel like Fujisawa is so good with everything else and doesn’t glorify these people’s perversions (he makes them seem very creepy, except for the guy obsessed with the car which is played for laughs) that it’s just a manga that everyone needs to read, and I hope Vertical is able to get GTO proper soon. I also figured out that once I have all of the GTO and the spinoff stuff from Vertical that that’s a grand total of 65 volumes (31 volumes (by Japanese manga count, 2 in 1 volumes over here make it seem less) for Shonan Junai Gumi, 25 for GTO, 9 for 14 Days), hope it can all fit on one shelf! I also hear Fujisawa is doing a spinoff on the cop from SJG, I hope that makes it over here too because GTO is one cow that deserves to be milked. I partially agree. There are definitely comic book adaptations of novels which, while fine comics in themselves, do not offer much (at least to me) which I can’t get from the original novel. But sometimes an adaptation (comic book or not) can draw out something I didn’t appreciate in the original. For example, while Tony Wong’s The Eagle Shooting Heroes is much inferior to the original novel, it a gorgeous comic, and makes the setting look more glorious, wonderful, and fantastic than it ever looked in my imagination while reading the novel, so I feel very satisfied that I read it. Anyway, if Melinda approves my pitch (I’m waiting for her response), you just might see a review of Tony Wong’s The Eagle Shooting Heroes appear on Manga Bookshelf. It’s not available in English, but since it should be read for the art and not for the dialogue (*definitely* should not be read for the dialogue) I don’t think it’s particularly important that it’s not available in English. I think I disagree. To me, this is like saying there’s no point in making a film adaptation or any other kind of adaptation. I think there can always be a purpose in adapting something to a different medium. That’s not to say that there always *is* a clear purpose, other than making more money on a popular story, and certainly it’s clear that sometimes that’s the point. But in terms of art and storytelling, I think there can be a lot of good reasons for adapting an existing story to a new medium. I think something that both a graphic novel and film adaptation have in common is that adding visuals to a prose story is kind of like setting a poem to music. It’s taking something that is open to interpretation and interpreting it in a particular way—sort of “directing” the audience’s visualization of the story, which leaves completely different things up to interpretation, potentially giving people new food for thought. Hmm, I hadn’t thought of it that way. But I only have so much time in the day and so much manga I want to read, I feel like I only have time for one or the other. Part of it could just be that I’m not the biggest fan of Yen Press’ manga adaptations, it sounds like they’re always lacking something (and I’m not counting Cirque du Freak in this because it was made in Japan off on its own, it wasn’t actually commissioned by Yen Press from what I understand, they didn’t actually start publishing the manga until that godawful movie was set to come out). But with a movie, I’m not usually reading, with a manga vs a novel, I’m reading either way, and while I’ve much improved my reading speed over the years, I’m still not super fast. A movie will be over in an hour and a half, if I go for a full manga series, it takes less time than a full novel series, but both will (usually) take me more time than a 90 minute movie. So time constraints are really the main reason why I feel like I can only do one or the other, at least at first. It’s why I look at these and go “I have limited time, I’d prefer to go for the better one right off the bat”, if I’m indeed interested at all. Heee! I love how the conversation moved towards Alexia’s voluptuous assets. XD I remember seeing a few panels in a preview and was surprised at how prominent they were. And as for GTO, I really know nothing of the series outside of the premise but this spinoff sounds like it might be a manageable gateway. Will be bookmarking it. Thanks for the recommendations, ladies!